An app which sends “sweet texts” to the user’s girlfriend in order to give him more time to spend with “the bros” has gone on sale in the Android Play Store. The creators of BroApp, which launched on Sunday and costs £1.49 to download, claims it allows men to “outsource their relationships” by selecting the type of text they want to send their partner and when. 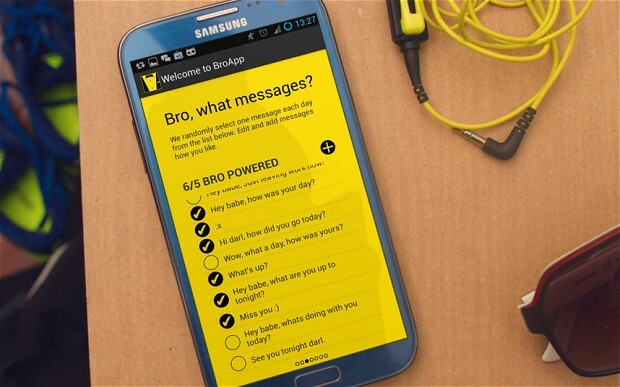 “BroApp is a tool to help Bros out,” Australian developers Factorial Products Ltd. said in a release. When the app is first downloaded, users are prompted to select the object of their affectionate texts with the question, “Bro, who’s your girlfriend?” The Australian-born feminist writer Germaine Greer is shown as a possible contact in a promotional video for the product. After this, boyfriends compose a number of texts, which can be timed to be sent automatically on a specific day, even if he is busy enjoying the company of his male friends. The makers claim that "BroApp leverages advanced algorithms to intelligently determine the best time to send a text message to your girlfriend". Men are also asked to identify their girlfriend’s WiFi network, so that his cover won't be blown by pre-written texts being sent to her while he is at her house. If the user has recently texted or called his girlfriend “in real life”, or she has recently contacted him, texts scheduled by the app are cancelled so as not to arouse suspicion that he is using an automated service. The creators claim the app also comes with a “girlfriend safety lock down” built in. “When BroApp detects an inquisitive girlfriend attempting to open BroApp on your phone, it sends that lovely lady to a list of gifts you were 'planning to buy' her,” the FAQ section of the app's website explains. Reaction to the app has so far been mixed, with some on Twitter suggesting there are “some things you shouldn’t outsource to technology” while others called the idea “genius”. The developers say a version of BroApp will soon be available for iPhone, but with no option of selecting a boyfriend, gay men and heterosexual women will be forced to compose and send their own romantic texts for the foreseeable future.